Due to the inclined hillside location, this magnificent villa has a stunning view over the village Cabris. Situated on a hillside, in the beautiful region of Provence, this spacious three bedroom villa enjoys breathtaking views of the village of Cabris, the distant sea, as well as the lake and the surrounding forests in Saint-Cassien. The holiday home offers plenty of space for all the family and includes an open-plan kitchen and living area, outside swimming pool and well-equipped summer kitchen. Two of the three bedrooms open onto the terrace area, from where you can admire the wonderful views - especially the beautiful sunsets. 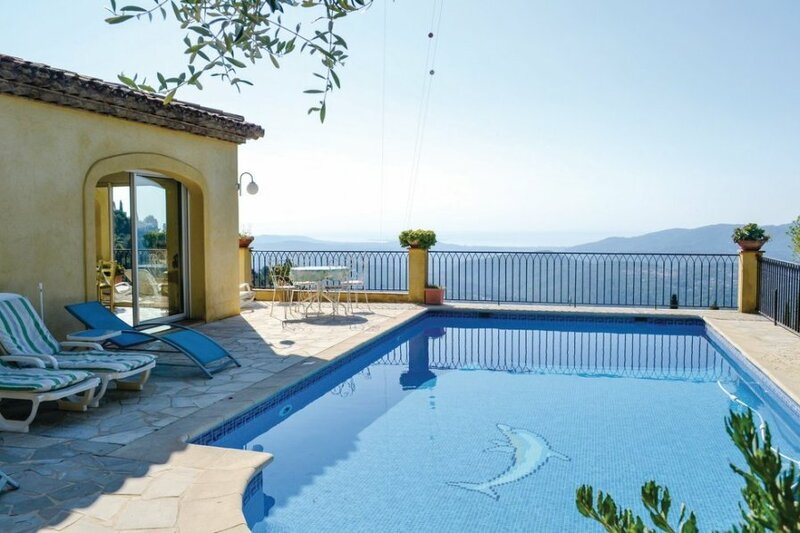 The villa is located just under 1km from Cabris: a charming town perched on the hillside in the French Riviera. The town has been referred to as a 'provencal paradise' and is home to old narrow streets, fragrant lavendar, shaded cafe terraces and authentic French eateries. Alternatively, simply relax in your villa and enjoy the occassional firework displays in the distance, courtesy of towns such as Cannes, Mandelieu and Antibes. Such towns can be easy reached via the highway that starts in nearby Grasse, just 8km away.